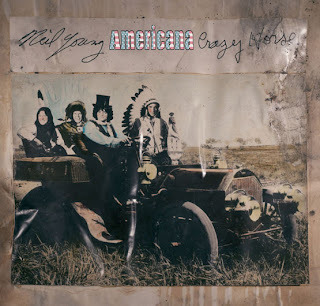 As we mentioned yesterday, with all of the anticipation for the upcoming album Americana by Neil Young & Crazy Horse, there's been a lot of focus on the song "Oh! Susannah". And just as we were reminded about The Byrds version of "Oh Susanna" along comes another "Oh Susanna" version. This show was screened on Feb. 17th 1971 but has been recorded in Nashville on Feb. 7th. Right after the recording Neil took Taylor and Linda Ronstadt to the Quad Studios to record the vocals on Heart of Gold. So this version of Oh Susanna and Neil's only numer one hit had been recorded on the same day! @ralfboe - Wow. Thanks for sharing. Very cosmic how these all converge. Now when did Neil come on Johnny cash? the following week? everyone should know that JT recorded this song and put it on the "Sweet Baby James" album...don't you all listen to anything else but NY? @Thrasher - AFAIK Neil's part was taped on the same day - Feb 7 at Ryman Auditorium Nashville, TN. He just had finished HOG before at Quad Studios and they later added Taylor's and ronstadt's backing vocals on tape. Elliot Mazer then finished HOG on early morning of Feb 8. Regarding all songs on the AMERICANA album there's much more to the picture than meets the eye: There's also a very cool relation to Bruce Berry and Danny Whitten. Bruce Berry's brother Jan Berry recorded CLEMENTINE as member of "Jan & Dean". The single reached billboard charts in 1960. It's a very cool rock'n'roll/surf/folk version and a perfect blue print for the Squires funky folk version of 1965/1965. Neil later sang about Jan's brother Bruce on TTN and recorded the album at the SIR studio of Jan's and Bruce's other brother Ken Berry! @ralfboe - oh really? So James, Neil & Johnny all there on the same stage, same day in Nashville?! Very cool. Didn't realize it was all one session! Will definitely check out Under the Rusted Moon! @Trasher - The lineup was James Taylor, Johnny Cash, Linda Ronstadt, Neil Young, The Dillards, Tony Joe White, June Carter. Johnny Cash taped some parts at Nashville's Vanderbilt University campus. But most was taped live at the Ryman Auditorium. Wow - I dig it big time...I wasn't going to listen to early leaks on the internet but I caved...this will sound fantastic through my Boston Acoustic speakers at home...hell just to have the Horse back here in 2012 is so great...long live Neil! !